The higher water temperature this year has allowed excessive plant growth in the river. 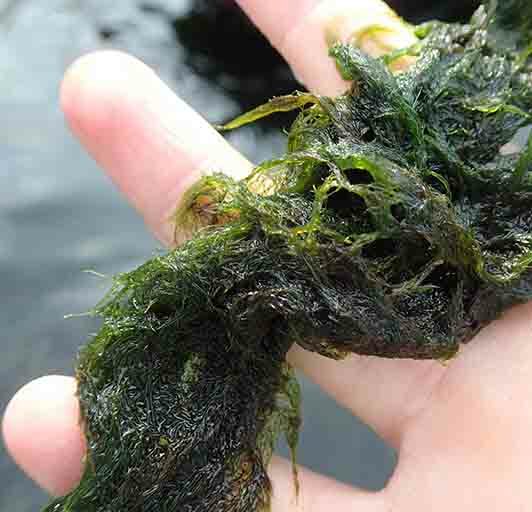 Algae such as this cladophora can be spotted in giant mats floating down the river and getting caught in fishing nets. For years, tribal members have been on the front lines of seeing the effects of climate change in the harvest of the First Foods. From earlier ripening times to odd game behavior, they’ve seen the ancient patterns disrupted more and more. Salmon and other fish are affected by these changes, as well. As the region warms, winter snows instead fall as rain and what snow does fall melts earlier. This results in the water traveling through the system during the winter, leaving much less during the hot summer months. The increased winter flows scour the riverbeds, disturb nests, and cause physical damage to both salmon eggs and juveniles, while the lower summer flows increase water temperatures further and reduces the overall habitat available to salmon. This year, the Columbia River basin has experienced a winter of extremely low snowfall levels and a summer of high air temperatures, which warmed up the rivers. The snowmelt came off earlier than normal resulting in extreme low flows in the mainstem and tributaries. While the 2015 Columbia River runoff volume is not historically low, the problem for fish is the combination of low flows and high water temperatures. The water temperature above Bonneville Dam, for example, has averaged 73º in recent weeks—9º warmer than the average for the same time period over the last five years. For salmon, that’s literally the difference between life and death. Fishers reported spotting many sockeye with ich infections that occurred in the warmer water. This one was found in Drano Lake, where a large number of sockeye sought refuge in the cooler water there. While the early high flows help adult fish returning in the spring, the summer combination of low flows and high water temperatures create a stressful environment for migrating adults and juveniles. 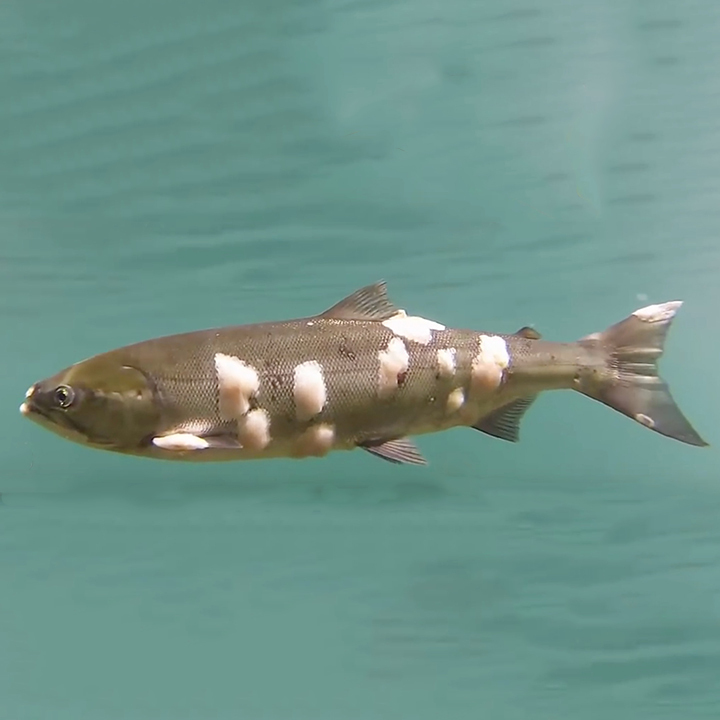 Often adult salmon will avoid warm freshwater, using precious energy reserves to swim around warm water areas or holding in cooler water refuges such as tributaries or spring-fed lake areas waiting for the temperature in the mainstem to cool down. This can delay or even prevent spawning. Higher water temperature can also speed up juvenile salmon development. This can result in smolts reaching the ocean before their food source, forcing them to survive on less or starve. Bacteria that can infect salmon such as ichthyophthirius multifiliis (ich) and columnaris (gill rot) thrive in warm water. These diseases spread more quickly when the rivers are crowded by low flows, and can lead to increased pre-spawn deaths. A recent USGS video showed severely infected sockeye salmon taking refuge in the cooler water of Drano Lake. Warm ocean temperatures favor fish like sardines and albacore tuna, but salmon and steelhead rely on coldwater nutrients. If the warm temperatures continue or expands, however, Pacific Northwest salmon and steelhead could suffer in coming years. This has happened to marine mammals, sea birds, and Pacific salmon in the past. Juvenile salmon and steelhead migrating from the Columbia River to the ocean this year and next may experience poor survival. The salmon region of the North Pacific Ocean has never been so warm for so long in recorded history. The expanse of warm water has sea surface temperatures as much as 3ºC (5.4ºF) higher than average, has lasted for months, and is hundreds of miles across. The situation does not match recognized patterns in ocean conditions such as El Niño or La Niña, which both affect marine food webs. NOAA’s National Weather Service estimates a 65 percent chance that a severe El Niño will occur this fall or early winter. This means higher temperatures and lower precipitation for the Columbia River basin. With more precipitation falling last winter as rain, drought conditions during the spring, and unusually high summer temperatures, by July the Wallowa Mountains this year were snow-free. Although this past winter and summer might be just a rare event, it could be preview of the new normal predicted by climate models. The Columbia River tribes have been working on planning for a changing climate, including climate change research, advocating for river operations modifications, calling for fish passage above Grand Coulee and Chief Joseph Dams, and completing habitat projects designed to help cool down tributaries. Addressing climate change impacts is also one of the recommendations in the tribes’ salmon restoration plan Wy-Kan-Ush-Mi Wa-Kish-Wit. These efforts, however, won’t stop a warmer climate. To even begin to do that that will require dedicated international cooperation. Knowing this, the tribes have been advocating for the United States to address this issue on a national and international scale. One of the most precious traditional teachings the tribes hold is the concept that “everything is connected.” For thousands of years, the tribes used this teaching to live in an appropriate and sustainable way on the earth. To properly address this threat, the world must be willing to listen and incorporate this tradtional Native wisdom into their activities and actions, not only for themselves and future generations, but for the very planet itself.